All A Bunch Of Momsense: Sadly Magical? It’s a little strange, we don’t usually go a week without any kids, but every once in a while, it happens. They were whisked off to Tennessee on Saturday where they have enjoyed days by the pool, hanging out with their Mamall (Mamaw, as spelled by a young child. E wrote it that way once, and it has stuck. We love it. ), Papaw and Uncle J. There’s been some shopping (so far, that girl child of mine has scored at LEAST 3 new pairs of shoes), a little video game playing, movie nights, and chocolate chip pancakes with whupped cream every morning. As much fun as that’s been, Wednesday begins a whole new adventure for them, as they head out for Orlando and the magic that is held there for children. Part of me is a little sad that they are going to get to experience that without me there. The sparkle in their eyes as they explore the parks, the silly laughter and smiling faces. The Disney parks, and so much more, truly are magical when you’re a child, and my mothering heart wants to get to share those moments with them. A whole different part of me is proud. Of them, of me, of my Dad. Of them, because I know that they are going to have a fabulous time, and they will probably behave better than they have ever behaved in their lives. Of me, because I am able to let them have this experience without hovering over them, because I can share these moments of magic with others who love my children as much as I do, and want a small piece of that joy as well. Of my Dad, because, well, he is taking 3 young children plus his wife on this grand adventure. I don’t say that to be mean in any way, I just can’t help but giggle at my stepmother, who has been as giddy, if not more so, than my children about this adventure! 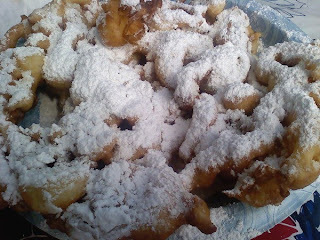 Love me some funnel cake. I should weigh something like 600 pounds. This was dessert, though – for me, it was the finishing touch to a grilled tenderloin and fresh lemonade. For hubs, it was preceded by some pulled pork barbeque and a lemonade. Yum on all fronts. Because, and yep, I’m going to say it again, I LOVE me some fair food. Funnel cake. You're speaking my language.